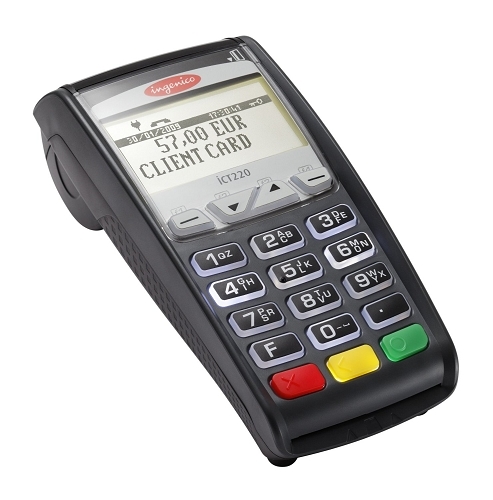 Ingenico, ICT220-11P2372A ICT220 CONTACTLESS V3 PCI 3.0 Lightweight, stylish and self-contained, the iCT220 is a rugged, easy-to-use counter top device that gives businesses the freedom to accept all types of electronic card payments without requiring an interface with a cash register or POS system. All iCT220 functions from payment processing and receipt printing to settlement reporting and brand enhancement programs operate flawlessly from a single, secure device. The iCT220 is fully EMV and PCI PTS V3 certified and supports the latest international security algorithms, so customer transactions are fast, private, efficient and secure. The iCT220 features a large, backlit keypad and crisp high contrast display to make PIN entry and option selection virtually effortless. In even the most hectic retail environment, the iCT220 increases the security and flexibility of your payment system. For merchants who want to allow additional customer interaction, Ingenico’s optional customer-facing PINpad, the iPP200 series, tethers securely to the iCT220 to enable customer PIN entry and contactless and NFC-based transactions.